Joshua Bell has been a classical music star since his debut at age 14. He has collaborated with everyone from trumpeter Chris Botti to opera star Renée Fleming, Alison Krauss, Josh Groban and even Vegas entertainer Frankie Moreno. 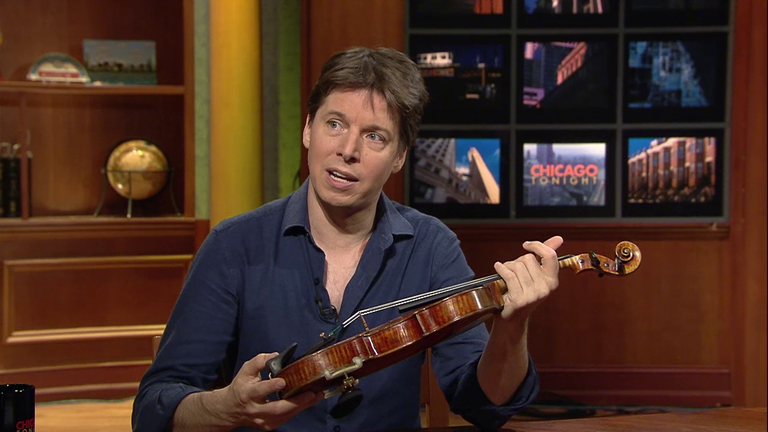 Now nearing 50, the Bloomington, Indiana native talks with "Chicago Tonight" about his early years, the greatness of the Stradivarius and his favorite collaborators in this encore presentation. He'll also treat us to a live performance with pianist Sam Haywood. Bell brought to our studio his gorgeous violin, a Stradivarius made in 1713. We asked him to tell us about it. "It's a pretty amazing thing. It's a work of art, it's also an incredible tool," he said. "They can't make them like this anymore, and I was very lucky to get this about 13 or 14 years ago. "There's something so magical when you pick up a Stradivarius. The sound has a refinement that's hard to describe in words, actually. The projection of a Strad in a concert hall is something also very special. You'd think we'd be able to just copy it and make it ... There's something, maybe the aging, something about the climate at the time in Italy. Most of the great violins were made in a very small town in Italy around the same time period, so it's a little bit of a mystery still, why these are so special." Part of what makes this particular Stradivarius so special is its recent history. Bell gave us the story. "One of the things that attracted me to this violin is that it was played by one of my musical heroes, Bronislaw Huberman–one of the great violists at the beginning of the 20th century–so just that fact alone makes it amazing for me to hold it," Bell said. "But this violin was stolen from Huberman in 1936. He was playing a concert in Carnegie Hall, where I'm playing next week, and someone snuck in the dressing room, took the violin and Huberman never saw the violin again. It disappeared for 50 years, and it turns out the thief did not try to sell it but instead he played on it for 50 years–in cafes and gigs and things like that. On his deathbed he confessed to having the Huberman Strad. And then it came back to the world and eventually into my hands, but I had to pay for it." Bell plays in more than just concert halls. Below is a video of the violinist playing in a Washington, D.C. subway station during rush hour–part of a now-famous stunt orchestrated by the Washington Post. We asked him what he took away from that performance. "I took away from it that music–particularly classical music–needs an attention and silence and an audience that's really concentrating," he said. "That's what's so beautiful about great classical music ... it requires the audience to really concentrate and take everything in. So to throw it at them on a subway platform while they're rushing to work–it just doesn't mean much. I was not surprised by the lack of response. I was surprised that it sort of took life after I did it, online virally. There's probably not a day that goes by that someone doesn't ask me about it." Winnetka's Kate Liu, 21, has become the bronze medalist and recipient of a nearly $23,000 cash prize at the 17th Chopin International Competition in Warsaw, Poland.